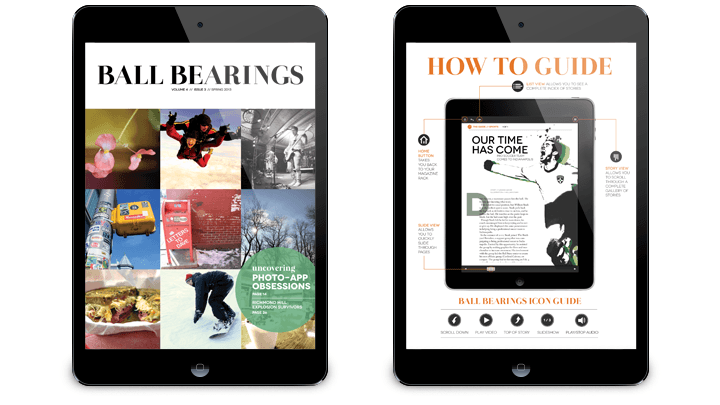 DPCI provided Adobe Digital Publishing Suite consulting services to assist Ball State University with the creation of the digital edition of Ball Bearings Magazine on Apple iPad and Amazon Kindle Fire. Founded in 1918, Ball State University is a state-assisted residential university in Muncie, Indiana. About 21,000 undergraduate and graduate students enroll each year in diverse academic programs on and off campus. Students in the Department of Journalism produce a student life magazine, Ball Bearings, recognized as one of the top collegiate magazines in the nation. The purpose of this award-winning magazine is to give journalism students immersive experience in producing a print and online magazine. Ball State University wanted to launch a digital version of Ball Bearings magazine to view on Apple and Amazon tablet devices. The University was looking for a cost effective way to deliver and manage digital content while using tools familiar to the students on the magazine staff. Since the staff is comprised of students, the University needed a solution where they could add and remove users easily and maintain the content in a central location, accessible by the students. Ball State University selected the Adobe Digital Publishing Suite (DPS) Professional Edition to create a rich, interactive version of Ball Bearings magazine using Adobe InDesign. DPCI was retained to provide Adobe DPS consulting services to facilitate the launch of the magazine app on both platforms. DPCI’s Adobe DPS certified consultants guided the magazine staff through the digital publishing workflow from start-to-finish to ensure timely delivery of the applications in both the Apple and Amazon marketplaces. Then, DPCI provided Adobe DPS training to magazine staff members on the creation of interactive elements for the digital publication. DPCI also helped administrators establish necessary roles and permissions for staff members to manage assets bundled within the tablet application. Prior to submission to the app stores for approval, DPCI assisted with the quality assurance of all assets bundled into the magazine app in accordance with Adobe DPS, Apple and Amazon specifications. Throughout the creation and design process, DPCI provided the Ball Bearings content editors with extended technical support including the validation process for Apple and Amazon applications, multimedia specification requirements and utilizing the Adobe Digital Publishing Suite Dashboard for publishing folios and building apps. DPCI helped Ball State University bring the print magazine to life on Apple iPad and Amazon Kindle Fire in December of 2012. 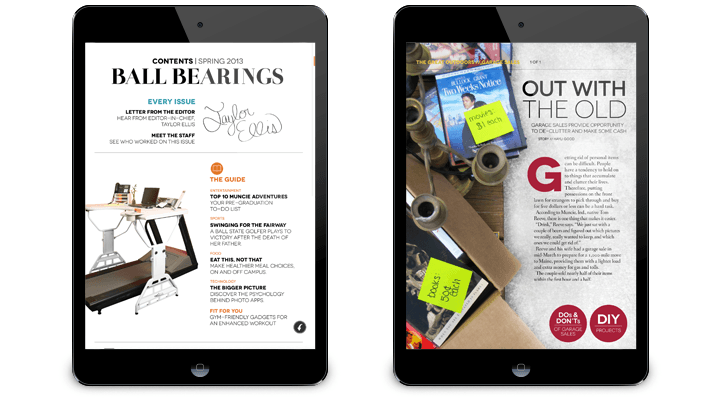 With the Ball Bearings magazine app readers can enjoy the same fresh and creative journalism from the print edition now in an interactive and user-friendly digital form.